Please allow 24-48 hours for someone to reply to your message. For a faster response, Please call WOTIM at (810)735-1959. Thanks! 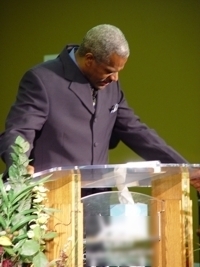 Solomon Turner, Jr. is an anointed minister and Founder of Word of Truth International Ministries. "Pastor T" as he is affectionately called, has a willing heart for service and a genuine love and compassion for the people of God. Solomon worked in the business culture for a large communication company for thirteen years. While working his way through the ranks and progressing upward, Solomon accepted the calling of God on his life. In 1985 he left the business world as an executive in response to God’s Directive on his life. Under the leadership of Bishop Keith A. Butler, Founder and Senior Pastor of Word of Faith International Christian Center in Southfield Michigan, Solomon served faithfully for seven years as Senior Assistant Pastor, Executive Board Member, Bible Training Center Instructor, Director of Pastoral Care and Management Coordinator of the Helps Ministry. For fifteen years, under the leadership of Dr. Phillip G. Goudeaux, Founder and Pastor of Calvary Christian Center in Sacramento California, Solomon also served as Senior Assistant Pastor. As a charter member, he was responsible for the establishment of the Ministry of Helps Department curriculum and volunteered as Head Deacon, Head Counselor and Elder. He was also Director of the "Faith Alive" Television/Radio Ministry, Singles Ministry, Real Men and Overcomers, a facility for those challenged with substance abuse. A yielded and dedicated man of God, Solomon is a no-nonsense teacher of the Gospel and is continuously sensitive to the move of Holy Spirit. A native of Northern California, Solomon is married to the lovely La Vita, his partner in ministry.